Final Fantasy is a series rooted in perpetual reinvention. Each entry in the nearly 30-year-old franchise features entirely new characters, new worlds, new narratives, and even wildly different game design, transitioning between regal fantasy kingdoms and cyberpunk dystopias in the blink of an eye. 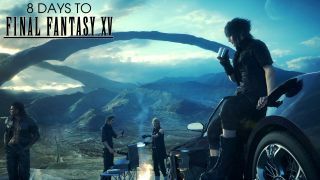 Final Fantasy 15 looks to be the biggest sea change yet for the series, embracing an open-world design and real-time combat while sending its heroes on a roadtrip across a vast world which balances on the cusp between reality and fantasy. But even while Final Fantasy 15 sets out to forge its own path, there are themes, motifs, and icons that keep popping up time and time again. These are the things that, even when combat shifts from its traditional turn-based roots to full-on action and stories flit between military boarding schools, moon whales, and evil clowns, each game still feels uniquely, and indelibly, Final Fantasy. In the 1980s Japan, Dragon Quest was king. Its slimes, dragons, and characters, drawn by Dragon Ball artist Akira Toriyama, were cute, drawing inspiration from the popular manga of the era. Director Hironobu Sakaguchi decided to take Final Fantasy in a different direction, embracing a much more somber and adult take for his fantasy-themed RPG. Chris Kohler, author of Power-Up: How Japanese Video Games Gave the World an Extra Life, refers to this aesthetic with a single word: sabishii. Sabishii translates from Japanese to loneliness or desolation, a feeling of longing and deeply rooted heartache. It's a feeling that the original Final Fantasy strove to achieve, immediately evident in the simple, haunting chord progression of its prelude. These are fantastical worlds, but they are worlds fraught with peril, teetering on the brink of destruction. Final Fantasy 7 opened in a science fiction nightmare, a dystopian city where the have-nots live on the lower level while those in power live on a plate hovering above them, permanently blocking out their sunlight. Final Fantasy 6's world literally ends half-way through, as the villainous Empire achieves their goals and rends the planet's continents asunder. Final Fantasy 13's characters are all cursed by the gods, doomed to turn into crystal if they complete their mission or monsters if they fail. Final Fantasy 15 embraces sabishii almost immediately, as the threat of invasion looms large and our hero, a young, brash Prince Noctis Lucis Caelum finds himself thrust in the middle of an ages-old war with the very lives of his subjects at stake. Luckily, he's got some help from his friends. Even when things are at their most dire, the one thing you can count on in a Final Fantasy game is that you won't have to go through it alone. The original Final Fantasy gave you a party of four characters that you could name and customize how you saw fit. These were the Four Warriors of Light, the ones destined to bring peace to a tumultuous world. Various entries throughout the series have played with this theme in different ways, their storytelling methods evolving with the technology of the era. Final Fantasy 2 featured four main party members, only now they were more than mere cyphers for the player, given predefined characteristics and narrative arcs. Final Fantasy 6 featured over a dozen characters, each coming from different backgrounds and cultures to come together to fight the threat of an omnipresent evil. The characters may have changed and the technology may have adapted to allow for higher-quality models and voice acting, but their struggles, their humanity, and their ability to band together under any circumstances stayed constant. Final Fantasy 15 is embracing its modern advances while looking back to its past. Noctis, Prompto, Ignis, and Gladiolus are all best friends, and each one brings unique skills, emotions, and perspective to the party. These Four Warriors of Light - a reference Final Fantasy 15 boldly makes in its opening chapter title cards - are on a road trip to save their kingdom, and attempt to find the peace and comfort in the small moments, even when the world seems to be falling apart around them. Like the technology that powers each game in the series, Final Fantasy's approach to combat has changed and evolved over time. Beginning as a purely turn-based system drawing inspiration from Dragon Quest, Final Fantasy began experimenting with more action-oriented elements. The Active Time Battle system was created for Final Fantasy 4 to make combat more dynamic, adding speed and timing to its strategic combat. Additional changes were made over the years. Final Fantasy 8 added small, reaction-based elements by allowing you to time button presses with Squall's gunblade strikes. Final Fantasy 10 went back to turn-based combat, but allowed you to switch your party members out on a whim, allowing for increased depth in how you approach its challenges. Final Fantasy 11 and 14 embraced massively-multiplayer online structures, allowing for more freedom of movement and a further blending of its real-time/turn-based hybrid. Final Fantasy 15 and its fully-realized real-time action combat, then, isn't so much an outlier as it is an evolution of the series' approach to battling evil sorcerers and ferocious beasts. And through it all are those little, white numbers. Every time you hit an enemy with a physical or magic attack, the effectiveness of your actions is displayed visually via a set of bouncing numbers. These numbers were important in the early days, as graphical limitations all but prevented more robust ways of displaying the damage you've caused through player or enemy animations. But over time, as the series increasingly embraced its action roots, these numbers became an anachronism. Why bother with numbers at all when a simple life bar would suffice? But they stuck around, even in Final Fantasy 13, where the numbers can reach into the six digit range and become all but meaningless during moment-to-moment gameplay. They're there in Final Fantasy 15, too. Not only do they how much damage you're doing, but their color indicates whether your attacks are effective in striking against specific weaknesses or rubbing up against natural defenses, allowing you to change your weapons and attack strategy instantly. The numbers stuck around because they were they were always there. As much as crystals and magic and airships, they're an important part of what makes Final Fantasy special, an icon of Final Fantasy's RPG roots. Watching those numbers fly out with each strike, watching them get bigger over time over the course of each journey feels good. It feels like progress. It feels like Final Fantasy. Even at its beginning, Final Fantasy existed on the cusp of fantasy and science fiction. While the first game was much more of a tale of swords and sorcery, of dungeons and dragons, you still got an airship, which you could use to fly around the world. It's a technological marvel in a land governed by crystals and magic. Many different motifs would appear and develop throughout the series. Chocobos first appeared in Final Fantasy 2, the yellow, ostrich-like birds providing a method of transportation over dangerous ground. The small and cuddly Moogles, first introduced in Final Fantasy 3, have often co-existed with humans in games throughout the series. These creatures and other monsters populate worlds where humanity's own hubris threatens the very balance of the world. The steampunk aesthetic of Final Fantasy 6 brings hulking Magitek armor against powerful magical entities known as espers; Final Fantasy 7 focuses on an evil corporation hell bent on sucking the very life force out of the planet's core. Final Fantasy 15, of course, is no different. This is a world in which regal kings rule over sprawling kingdoms, where people drive convertibles, use cell phones, and drive down a freeway which wraps around a massive crystalline meteor in the center of a lush, green valley. It's a place where Noctis and his friends set up store-bought tents on top of glowing runes; where hidden mystical weaponry hides away in ancient caverns; where you can rent a chocobo to help you speed through the wilderness - but only after helping the local rancher clear out his behemoth problem. Gas stations and diners dot the countryside, their patrons speaking in hushed tones about the tenuous political climate or the pack of wild monsters harassing their crops. Final Fantasy 15's blend of real world technology, mysticism, is deeply strange when held up to its contemporaries - but it's the kind of unique and fascinating setting that you'll only be able to find in Final Fantasy. On the eve of Final Fantasy's 15th release and its 30th year of existence, it's easy to forget that as much as things have changed, they've stayed the same. That's what makes Final Fantasy so special, though - it's a combination of the nostalgia and longing of the themes and icons of yesteryear while maintaining its gaze the distant horizon. It's a feeling you'll get whether you're listening to the over 200 songs from the Final Fantasy series while driving around Final Fantasy 15's world or Yoko Shimomura's dynamic and cinematic soundtrack. Final Fantasy 15 is a remix of all the things you love about the series, shifted into new contexts to create a brand new adventure that old and new fans alike can enjoy. And that's the most Final Fantasy thing of all.